On the Tools menu, click Hot Desk Session Timeout. 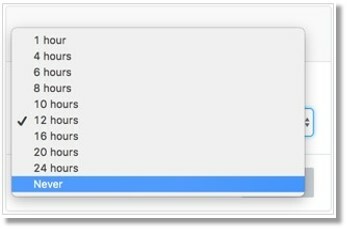 Configure your Hot Desk Session Timeout select between 1-24 hours (1, 4, 6, 8, 10, 12, 16, 20, 24 hours, and Never). IMPORTANT: When the Session Timeout is set to ‘Never’, all hot desk sessions on the account will never timeout. Hot Desk sessions can only be logged out by a user from the phone.